I have given below the recipe of a basic chocolate sponge cake. You can have it as it is, add frosting of your choice or use it for making a Black forest cake. I made 2 small cakes using this recipe. I used one for making a black forest cake. It came out awesome and resembled the one you get in a bakery. The recipe of Black forest cake can be found here. Powder the sugar in a mixer, check that the eggs are at room temperature and keep the butter outside the refrigerator so that it can soften a bit. Softened butter is easier to beat but do not allow it to melt. Now sieve together maida, baking soda and cocoa powder twice and set aside. Then take a large bowl, add butter and sugar and mix. When both the ingredients are mixed well, add eggs one at a time and beat well. Now add salt, vanilla essence, milk and beat till all the ingredients are well mixed. Now preheat the oven at 170 degree Celsius with both rods on for 10 minutes. Meanwhile, grease two aluminium cake pans with butter and then flour with maida. Dust away any excess flour and keep the pans ready. Then add the maida-cocoa mix little by little to the egg-butter-sugar mix and mix well either with a wooden spoon or with your hands. Make sure that there are no lumps. Divide this equally between two cake pans such that they are half full and place them in the central rack of the oven. Cook at the same temperature with upper and lower rods on for 20 to 25 minutes or till a toothpick inserted comes out clean. This recipe makes two cakes of 5 ½” diameter and 1 ½” height. You can also cut each cake into 2 layers and assemble with cream to form one large 4 layer cake. Always wait for a few minutes before taking out the cake. Allow it to cool down completely before cutting. Keep it in an air tight container and/or refrigerate for later use. yummy and so soft looking. keep up the good work. Awesome sponge cake... looking forward to see the black forest! 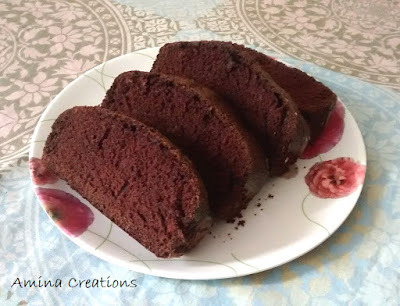 Cake looks so rich and decadent - perfect texture too!I would looove a biiig bite please:)And yes,I'm waiting with bated breath for your Black Forest cake recipe,so please do post it too! Wat a marvellous super spongy cake. nicely done, amina..and can't wait for the black forest recipe, I bet they are delicious! 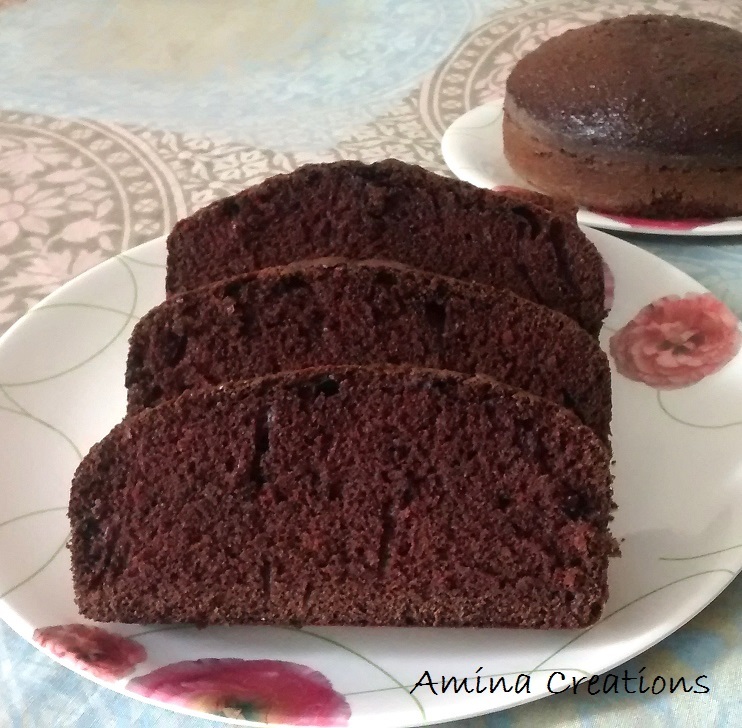 Thank u for dropping by my blog, the chocolate cake looks so moist and spongy, following u..
Looks very soft and beatiful texture, perfect for evening snack. Very beautifully and perfectly prepared. Looks soft, spongy and tempting. That looks amazingly yummy dear! So soft n spongy chocolate cake,looks so yummy. I tried your recipe and the cake turned out to be absolutely delicious and soft. thanks a lot! can't wait to try your other recipes.